(Nanowerk News) Ultracold atoms in the so-called optical lattices, that are generated by crosswise superposition of laser beams, have been proven to be one of the most promising tools for simulating and understanding the behaviour of many-body systems such as solid crystals – for example with respect to their electric or magnetic properties. However, the implementation in free space has some limitations such as the distance between the atoms (around 400 nm) and the short range of the interactions. Now a team of theorists around Prof. Ignacio Cirac (MPQ, Garching) and Prof. Jeff Kimble (California Institute of Technology, Pasadena, USA) suggests a new set-up that integrates the advantages of ultracold atomic physics and nano-photonics to circumvent these limitations predicting lattice constants about ten times smaller than in a free space optical lattices and the possibility to mediate longer range interactions (Nature Photonics, "Subwavelength vacuum lattices and atom-atom interactions in photonic crystals"). 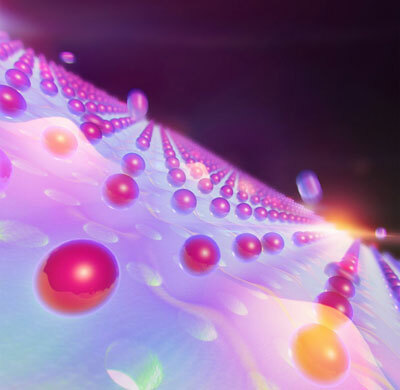 The authors use the opportunities provided by nano-engineered dielectrics, the so-called Photonic Crystals, to study both how to trap the atoms closer to each other and make them interact through the guided modes in the structure. As a consequence, the energy scales of the system are increased as well as the range of the interactions, being able to explore new forms of quantum many-body matter. “Our analysis show that we should be able to achieve atom-atom-interactions, where the interaction mechanism is not by atom hopping (as in free space optical lattices) but by exchange of photons”, Alejandro González-Tudela says. “The result is a two-dimensional solid where the atoms are held together and talk to each other not by phonons – as in regular matter – but by photons. This implies a qualitatively new domain for light-matter interactions, with the capability to ‘design’ the strength and the range of the interactions. We would gain access to a rich set of phenomena, including, for example, quantum magnetism or spin-spin-interactions mediated by photons.